Whiten your skin, clear freckles and spots. Fade sun spots, freckles, and scars with vitamins! Chocola BB Lucent C is a vitamin supplement that whitens skin! Take Chocola BB Lucent C every day to fade dark spots and achieve a flawless, glowing complexion. These supplements are formulated with all the Vitamin C you need to brighten and whiten your skin. Lucent C also includes Vitamins B2 and B6 to help skin renewal, and Vitamin E for skin repair. Our bestselling skin whitening product! Chocola BB Lucent C is continually one of our best selling products! Our customers love how well they work and the peace of mind that comes with taking a healthy, vitamin based beauty supplement. The Chocola BB series is loved around the world for their effectiveness and safety. In fact, Chocola BB Lucent C is made from vitamins that are essential for our health. In other words, there are no mysterious chemicals or unsafe ingredients! Take Chocola BB Lucent C to improve your health and the beauty of your skin at the same time. 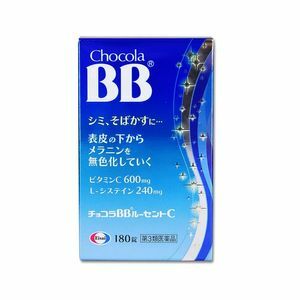 Chocola BB Lucent C is made to meet Japan's strict quality standards. This whitening supplement is also available in 60 tablet and 120 tablet sizes. Looking for the best deals for Chocola BB Lucent C?